Just about a year ago, Bill Mondegreen and I started talking about opening a jazz club in SL. We both knew that there was a plethora of jazz clubs in SL already, but one thing we noticed about these "jazz" clubs. Very few of them actually played Jazz! I had been to jazz clubs that played nice music...Frank Sinatra and Tony Bennett. Maybe some Sanborn and Kenny G (gags.) We found it odd, that you could go to a jazz club and not hear a single instrumental piece, as if jazz only was a vocal idiom. The reality is that most jazz IS instrumental music. Jazz has always been not about the song itself, but about the players. We saw a void in the SL music scene that we hoped to fill. So Bill built a club. And it was a beautiful club indeed. Shortly after opening, we moved to Marco Island, and Bill did himself one better by improving an already gorgeous club. We started with three DJs, one live performer and a lot of hope. Bill and I played straight ahead acoustic jazz, and Cataplexia Numbers played a more eclectic mix of smooth jazz and swing. We had the great guitarist, Joaquin Gustav, on a semi-regular basis. In time we added two blues DJs to the mix, Isobela Capalini and Hy Gynoid. Later we added DJ Donagh Dougall and Borday Moo to the blues mix, and also the fantastic jazz/fusion of Oggden Zessinthal. Finally, we lost Don, but found bigd. Funny how we can find a jewel that has always been with us, huh? For me, personally, The Savoy has been a most gratifying venture. First off, it re-ignited my passion for jazz. I cannot count the number of times I've been listening to this amazing music, while people are happily chatting and obviously satisfied, sometimes thrilled, which is exactly how I feel at times. Thrilled by the flights of Bird on Salt Peanuts. Mesmerized by Miles and Trane and PC on So What. Astounded at the intricacy of a Monk or Mingus composition. Heartbroken by the voice that is Billie Holiday. Joyously smiling at the genius of Louis Armstrong or Oscar Peterson. Grooving in my chair to Horace Silver and Joe Henderson. And having an Idle Moment with Grant Green and company. I have chills right now thinking about this, wondering how I could possibly bring this SL "job" into my RL. But for now, there is the Savoy, possibly a bigger part of my life than it should be, but there it is. My passion. "Jazz washes away the dust of everyday life." - Art Blakey. Yes,sir, it certainly does. I love it! You're the bestest boss (and friend) ever! :) Muah! A jewel, eh? What kind of snide remark is that? Wait, that was nice. Very, very nice. Thank you C. I love my Sunday mornings at savoy:)! 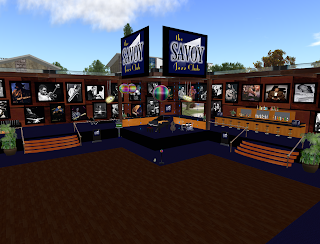 The Savoy is with out a doubt one of the best Jazz/Blues clubs in SL. While not as active as some of the others, it does have a quiet elegance. Open Dance floor, stage with piano, bass and drums that offers a comfortable environment where you can sit back, listen to some of the best Jazz and Blues being played in Second Life, not to mention Nina, and Inchino, two of the best vocalists out there. Wow, jewels, jazz and the most wonderful people people ever. I thought it last night as you and Bill tag teamed, you are a great team. You bring the same things to the table in a different presentation and couple that with differing qualities you possess, it is a recipe for success. You are both so very knowledgeable regarding music in general and I learn from you every time I attend your gigs. I hope you are planning an amazing blowout of a party for the one year anniversary. I look forward to attending and I look forward to more of your posts in this blog. Congrats on the new blog. I love Tuesday nights at the Savoy; my second-favorite night of the week. Sunday morning are wonderful as well though I don't get to them nearly as often as I would like. It thrills me to read these comments. That's the most important thing....that we have a good time. I hope everyone has at least half as good a time as me, cause I'm having a blast...heee.